I found this recipe on Pinterest from Classy Clutter. 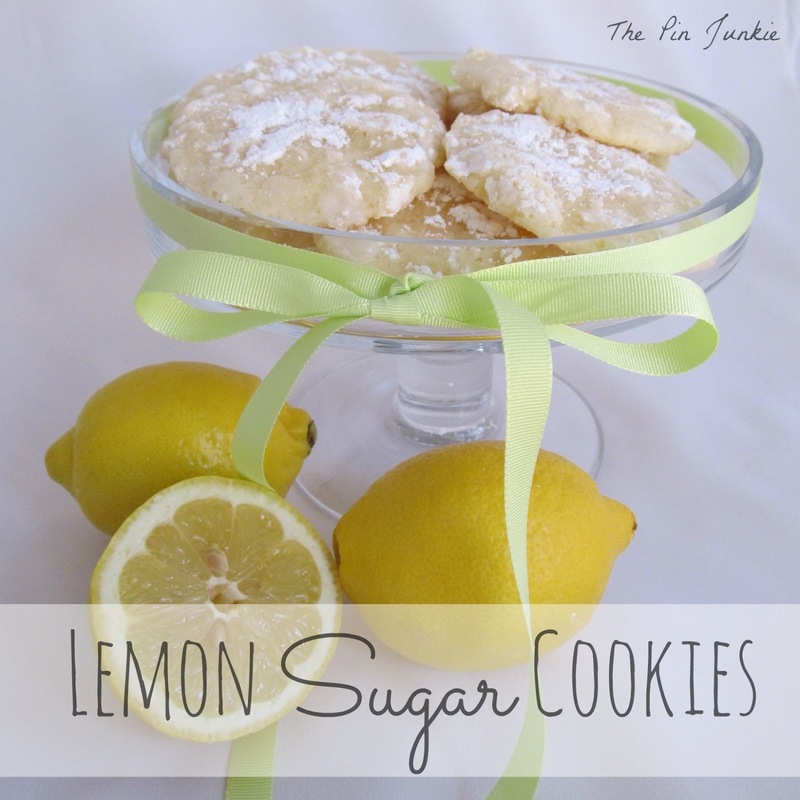 These cookies are sweet, lemony and they melt in your mouth. There's no way you can just eat one! Unless you have super human will power, you'll want to plan on sharing these cookies with a friend, neighbor, or anyone you can give them to. Just get them out of your house as fast as you can so that you're not stuck eating the whole batch! Not only are these cookies delicious, but they're very delicate and pretty too. After I mixed the dough, it was very soft so I chilled it for about 20 to 30 minutes to get it a bit more firm and easier to work with. These cookies have such a high sugar content and could burn easily. I lined my baking sheets with parchment paper to prevent the cookies from burning. I also added a little more powdered sugar after baking the cookies. 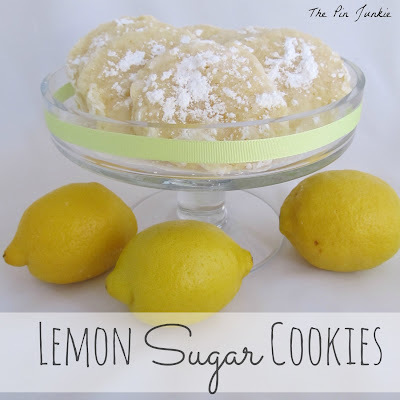 Inspired by this pin for lemon cookies. These cookies looks so yummy feel like grabbing one right now. Oh, how yummy looking! My mouth is already watering! Yummy! I think I need to make these asap. :) Stopping by from What to do Weekends' Linky party! Yum! I love anything lemon. I'll have to give these a try. Thanks for the recipe! Thanks for the invitation Nicky! I linked up. I'm a sucker for a lemon dessert! Stopped by from Pin Me Party and pinned! They look scrumptious! I love lemon. Yum! These look and sound delish! can't wait to try them! These look pretty and delicious. I love lemon bars so I'm sure these could be a new favorite. I've wanted a good lemon cookie recipe... I love lemon desserts. Thanks so much for sharing this with us on foodie friday. These looks look fantastic. You have a great blog here. Come visit us and check us out on Pinterest too. We have some great boards. Great cookies. WOW! They look melt in your mouth GOOD!! Thanks for sharing at my Pin Me Party! These sound so good - I like that they're still soft and delicate! I bet the lemon just makes them that much better :) Thanks for linking up to All My Bloggy Friends! I can't wait to see what you link up this week! I'm a huge lemon luvr and can't wait to try these! The parchment paper is a great tip. Thanks for the invitation! I'll be there! A perfect summer cookie! They look yummy! Thanks for sharing at Share Your Stuff Tuesdays! Sugar cookies are one of my faves. Loving the lemon twist to them. Thanks for sharing at Wicked Good Wednesdays! Oh this gets a triple YUM YUM YUM!!!!! : ) Hugs...TFS! These look fabulous! Thanks for sharing at the Tried and True Recipe party. We just featured these mah-velous cookies on our Super Saturday Link Party! Come link up some more great recipes! We'd love to have you share again at http://bakerette.com/3-super-saturday-link-party/! You have some great stuff!